I came across this photo in the American Memory Collection at the Library of Congress. It depicts the steamer William Henry Mack and the West Third Street Bridge, in the Flats, in March, 1913. 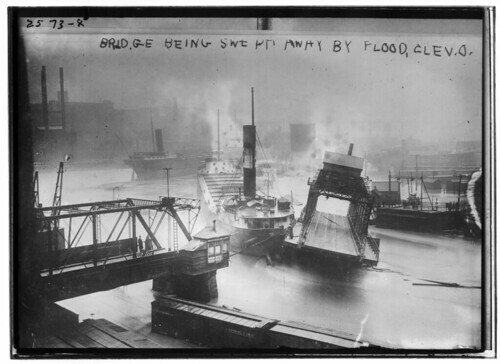 Much of the midwest suffered the effects of flooding during the spring of 1913. The high waters caused the William Henry Mack to break free of its moorings and crash into the bridge. According to The Lightship, volume 24, issue 4, the March 25 accident caused $20,000 of damage to the ship and demolished the bridge. The swing bridge is on the site of the present West Third Street Bridge. The photographer was looking approximately due east. One of the boxcars in the foreground is or was made to carry automobiles for the Baltimore and Ohio Railroad. The article about the William Henry Mack (later the Valcartier), on page 7 of The Lightship, is really worth checking out. It provides a full history of the ship, which was built in 1903 by the American Shipbuilding Co. Very interesting! Thanks for your devoted appreciation to the area!